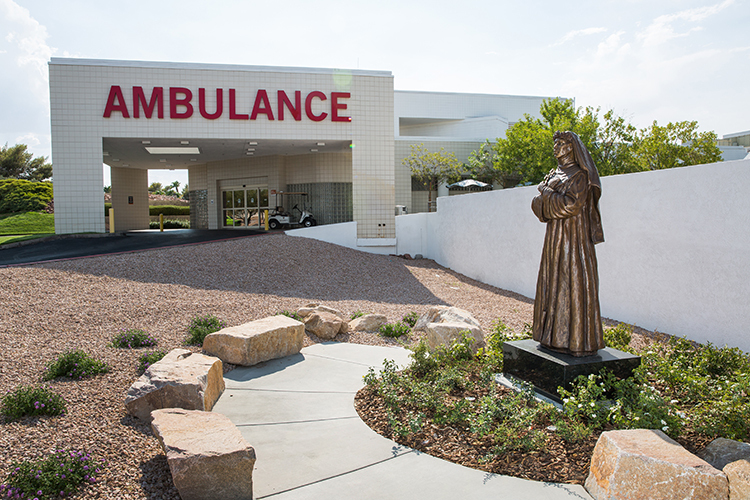 February 7, 2019, Henderson, Nevada – The St. Rose Dominican Health Foundation recently showcased the spirit of Dignity Health-St. Rose Dominican Hospitals through two installations: a statue of St. Rose of Lima on the St. Rose de Lima Campus in Henderson, Nevada, and a photographic story wall at the San Martin Campus in Las Vegas, Nevada. Matt Glenn, of Big Statues of Provo, Utah, was commissioned as sculptor of the statue of St. Rose of Lima (1586-1617), the first canonized saint of the Americas and a Dominican Tertiary known for her love for the poor, visions, and life of penance. During the 70th year of service of St. Rose Dominican Hospitals, the Foundation supported the creation of a statue built in honor of St. Rose of Lima and in recognition of the contributions to community health of St. Rose de Lima Campus. “St. Rose de Lima was an incredible woman and being able to sculpt her in bronze and have her stand as an iconic statue for the next couple hundred years has been an important part of my career,” Matt said. “This statue will continue to inspire many and represents a message of faith, hope, and the healing process.” The 1,000-pound statue stands at 8 feet tall. The St. Rose Dominican Health Foundation created and funded the installation of a photographic story wall depicting the rich history of the Adrian Dominican Sisters and Dignity Health-St. Rose Dominican Hospitals. The first wall was completed in 2017 at the Siena Campus and a blessing ceremony was held with the Adrian Dominican Sisters and the St. Rose Dominican Health Foundation Board. The Siena wall is located next to the Emergency Department in the Dominican Tower. The second wall was completed and installed just off of the lobby of the San Martin Campus in 2018 and a blessing ceremony was held in the fall that year. “The history wall was created to celebrate the pioneering spirit of our Adrian Dominican Sisters and calls our current and future health care teams to aspire to great works of healing and humankindness,” said Charles Guida, President of the Health Foundation.